You have this secret dream. The deep dark kind that would make you afraid if anyone else found out. You want to ….. name your own plant. Not a pet name like Bob the Cactus. Hey meet my friend Ilex Jessica Holly. Here’s where Hubert once lived. He’s just a stump now. Naming plants. Now that would be so Michael Dirr! Louis had that same dream also. His plant descended from the Far East. Every summer, no matter how cold the winter, it always wowed the neighbors and his coworkers. A few just passed it off as a novelty. Louis only listens to his encouragers. It is such a beautiful plant. It gives us all joy. Why don’t you display it at the flower show? Well Louis thought about it. Yea, I like to put smiles on people’s faces. Good idea. Let’s do it. The entry forms arrived in the mail. Louis hates paper work so he asks his wife to fill it out. Louis had decided to enter some more of his favorite plants also. The plant was bursting with large white inflorescences serrated petals (sepals) highlighted with a hint of blue in the center of each bloom (sepal) grouping. “Mine too!” Louis responds. That’s why I’m naming it after you, Madame Emile Mouillère. Louis is the famous hydrangea breeder Monsieur Emile Louis Mouillère. Please don’t confuse him with his son and legacy breeder know as Louis Mouillère. This story is how I imagined it might have happened around known facts. Monsieur Emile Louis Mouillère was a French horticulturist in the late nineteenth and early twentieth century. He made his home and hydrangea legend in Vendôme France where his family hydrangea legacy lasted until the mid1950s. Mouillère was fortunate to receive a part of a donated hydrangea collection from Veitch Nurseries in England. These 500 plants were gathered during an 1877-1879 Far East expedition sponsored by the nursery. Veitch did not see the potential value for the plants. The Royal Horticultural Society of France opened their annual Flower Show May 17, 1909 in the Tuileries gardens. The Weekly Florists Review covered the event in their June 1909 edition. With that description I’m seeing Penny McHenry Hydrangea Festival and Standard Flower Show in my mind. The article continues. ‘Mme Emile Mouillère 1909, hybrid (x Grandiflora Mariesii Rosea) was the official name at that time. In later years Grandiflora Mariesii was changed to ‘White Wave’. NEW VARIETIES OF HYDRANGEA HORTENSIS. 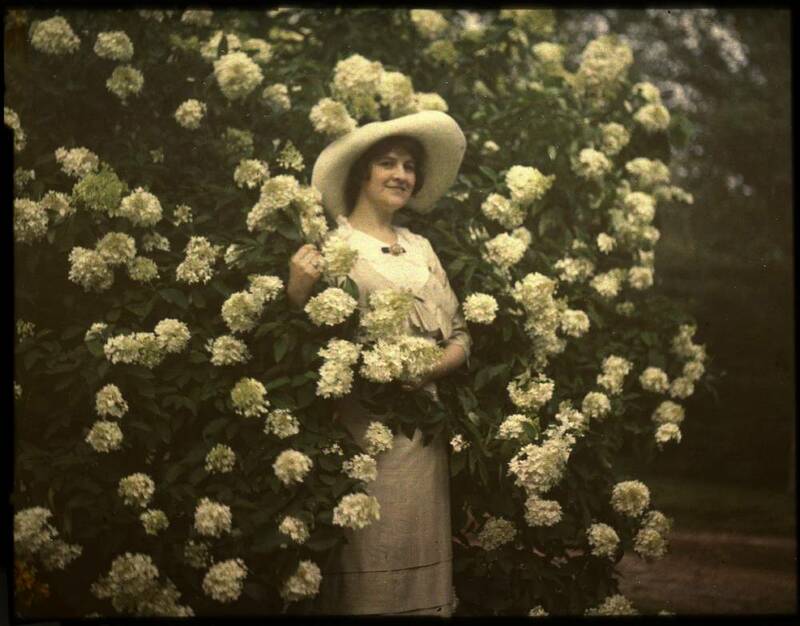 The Mouillère family put Vendôme France on the hydrangea breeder’s world map. During the first half of the twentieth century close to one hundred hybrids were developed. Many can be seen today in the center garden at the remains of a medieval castle in Vendôme. These are considered classics beautiful varieties in hydrangea history. ‘Mme Emile Mouillère’ is the theme hydrangea for the eighth running of the Penny McHenry Hydrangea Festival in Douglasville, GA. It is a classic hydrangea that has held its own for one hundred nine years in flower show history. ‘Mme Emile Mouillère’ blooms are a butter-white turning pinkish as it ages. The sparking blue or pink eyes capture your attention. The plant is extremely reliable and cold hardy with consistent blooming for its audience. It is a cross of ‘White Wave’ and ‘Rosea’. Remember the original 500 hydrangea brought from the Far East. It is now know as Hydrangea macrophylla ‘Mme Emile Mouillère’. McPlants will again build a designer show garden on the grounds of the Cultural Arts Center located in the heart of Penny McHenry Hydrangea Festival at 8652 Campbellton St, Douglasville, GA 30134. Access is free. Catch the free shuttle from the Douglas County Court House campus. Self drivers exit 36 on I-20 then north on Campbellton Street. Park in Douglas County High School parking lot or the Cultural Art parking lot in back. You will be able to access many parts of the festival from this location. See Schedule for all Festival events. Many planning hours and days go into developing these gardens for your enjoyment. We look forward to presenting this garden to you every year. I would love to see you. Come by and let’s chat. I want to hear your clever plant names.